It’s less than two weeks until #GivingTuesday (November 29th this year) – a national day of online charitable giving (strategically after Thanksgiving, Black Friday, and Cyber Monday), and all of the nonprofit blogs are abuzz with tips and tricks to make your campaign the best it can be. Since its inception in 2012, Giving Tuesday has generated $116.7 million for nonprofits globally, with over 40,000 organizations in 71 countries participating. Even though the movement seems to be going strong, many local organizations expressed that they’ve decided not to participate in a global campaign because they feel like their message would be lost in a crowd of “asks” and the preparation for the event would be incredibly time consuming, even though GivingTuesday.org offers several tool kits and resources to help beforehand. More importantly, those in fundraising positions reiterated that they want to be engaging and receiving donations from their supporters year-round, and asking on Giving Tuesday is counter-intuitive to this. You can read more about why many nonprofit leaders advise avoiding Giving Tuesday. 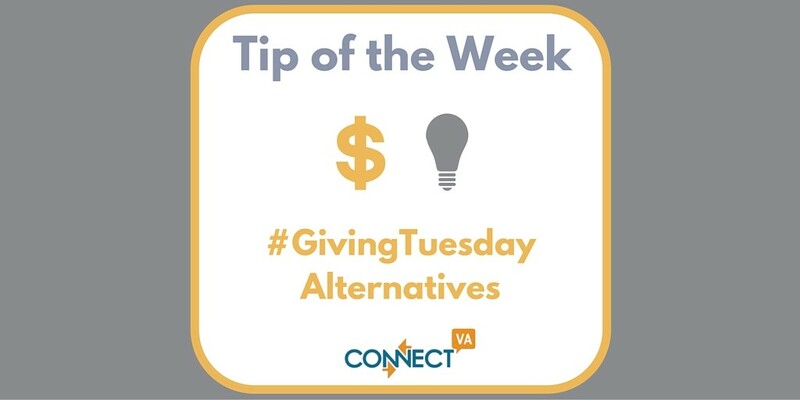 With this in mind, we’ve compiled five alternatives to Giving Tuesday for engaging donors, volunteers, and staff this holiday season and throughout the year. Thank your donors and volunteers instead. Use the Thanksgiving holiday as an opportunity to simply thank your constituents in an e-mail and/or social media post(s). Better yet – ask a family or client your organization has impacted to help write a thank you note. Reconnect donors and volunteers with your mission and reiterate how their donations (and hours) have made a difference. Jump on the holiday shopping bandwagon with Tribute Gifts. People are looking for ways to give back during the holiday season – and socially conscious shoppers like giving “gifts” that impact an organization’s mission. Nonprofit Tech for Good has compiled some great examples of nonprofits who have launched effective tribute gift campaigns, as well as a list of nonprofit online stores for inspiration. Focus on volunteer engagement instead. Volunteer opportunities are in high demand during the holiday season. Often there is much more demand than supply during the holiday season, especially in Greater Richmond. HandsOn Greater Richmond has created a resource page to educate volunteers and lists alternative ways to volunteer/help nonprofits. If your organization doesn’t have the resources for a large volunteer project, there might be smaller-scale ways you can engage people, such as having them lead in-kind donation drives, or working on a DIY project. If you have items that you need (or have available) you can post this information on ConnectVA’s Item Exchange. Learn skills to make your campaigns more effective. According to TechImpact, lack of planning, promotion, media relationships, or video content are all reasons why crowdfunding campaigns often fail. Spend the time you would normally be planning your Giving Tuesday campaign on planning your donor engagement strategy for 2017, reaching out to the media to cultivate relationships, or learning how to produce a great video. You can take the Cultivating Corporate Partnerships and Sponsors class, the upcoming Courting the Media class or watch a webinar hone in on these skills. Learn from your peers and consider creating your own campaign. This year we’ve seen a spike in local organizations creating their own grassroots online campaigns that span from 12-hour events to multi-day giving challenges. Some examples are the Amazing Praise, Close the Gap, The Amazing Dream and $5k for RVA. Read more about what worked for them, what didn’t, and reach out to your nonprofit peers to learn more! Is your organization still planning to participate in #GivingTuesday? Tell us about it! We’d love to hear about your successes, challenges, and “to do next year’s” in the comments, or shoot us an e-mail at info@connectva.org.